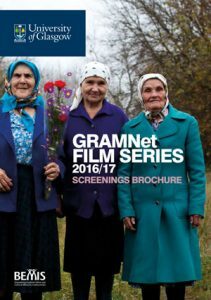 The 2016/2017 Film Series is organised in partnership between GRAMNet and BEMIS Scotland. This year we bring you documentary and feature films from Scotland and around the world making up a programme that illustrates the diversity and commonalities of those who endure exile and persecution. The films we have selected, and for which we have received generous support often from the makers and distributors themselves, depict stories of people who must manage extreme risk in order to survive and flourish. Using the compelling medium of film, the series explores difficult questions of what it means to be human and how powerful structures place human beings in complex scenarios which force people into exceptional circumstances. These are stories of loss, but are also stories and acts of resistance, solidarity, and empowerment, revealing survival strategies which bind people together forming communities of hope against adversity. The films in our series are groundbreaking in terms of content, form, and production methods: protagonists themselves become filmmakers by documenting their own epic journeys of exile and refuge; historical and personal video footage gives an intimate portrayal of life in a refugee camp; cameras hidden in bags and clothes get inside detention camps to expose the horrors of detention; and film crews spend months returning to toxic exclusion zones to capture the defiance of the human spirit. Together these films create a picture of lives in motion, refusing to be denied their right to exist. Screenings are accompanied by forums and Q&A for everyone to share their views and thoughts in a friendly and supportive atmosphere. The audience is warmly invited to congregate in the Centre for Contemporary Arts (CCA) Cafe following each screening to continue our informal discussions. Sponsored by GRAMNet, BEMIS Scotland, the Iona Community, and the North Glasgow Iona Community Family Group, with the support of the Equality and Diversity Unit, University of Glasgow.